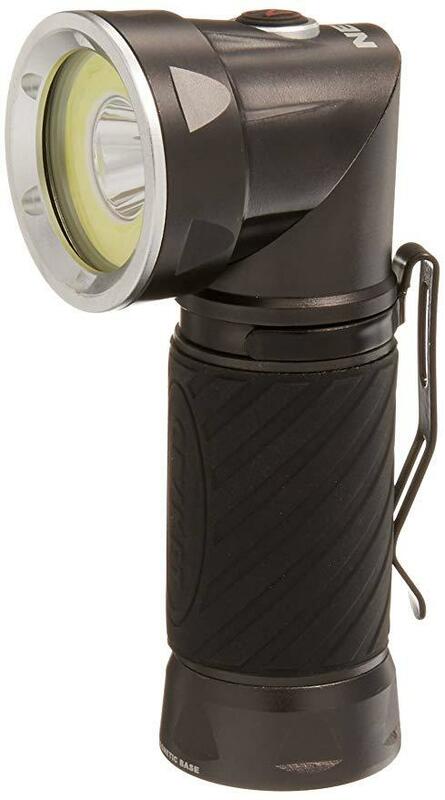 The NEBO CRYKET is a versatile 3-in-1 LED light, featuring a 240 lumen COB work light, a bright 250 lumen spot light and an intense red light. Its unique swivel design allows the light's head to rotate into a forward-facing light, perfect for various working conditions. The magnetic base and steel clip provide convenient hands-free lighting. Light: High-power 250 lumen LED spot light. High-power 240 lumen COB flood light. High-power 15 lumen COB red light. Light Modes: Spot-light (250 lumens)  3.5 hours / 113 meters. COB flood light (240 lumens)  2.75 hours / 21 meters. Red (15 lumens)  6.5 hours / 6 meters. Design: Fully dimmable (spot light & flood light). Anodized aircraft-grade aluminum; water and impact-resistant. 90 degree swivel head. Power memory setting. Direct-to-red feature. Steel belt/pocket clip. Powerful magnetic base. Rubberized non-slip grip. Operation: Top-positioned, ON/OFF button. Battery: Powered by 4 AAA batteries (included).